And All New Products Getting Released in Next One Year! Helium UI Kit is a Bootstrap 4 UI kit that comes with more than 100 ready-to-use elements and components. This kit has been developed using all the latest technologies such as SASS, CSS3, and HTML5. This is highly customizable and very well-designed. It comes with a code structure that is block-based which means that you can easily build your very own comprehensive web layout within a matter of minutes. In addition to that, each block is categorized/placed is separate CSS/HTML/Sass files. The Material is a multipurpose website template as well as a UI kit. It is perfect for portfolio websites, businesses, startups, and agencies. It uses the latest technology in designing the templates, so the pages are highly responsive. It has more than 25 pages that are ready-to-use and more than 100 UI elements. It is based on Bootstrap 4, so the pages are responsive and can be readily used. The UI design inspired by Google’s Material Design and has some compelling features. Grand is conference and event bootstrap 4 HTML5 website template. It comes loaded with all the necessary elements and components to be able to launch a full-fledged conference or an event website in a quick and hassle-free manner. This is very well-designed and has been particularly crafted and built for organizing stunning conference and event websites. When you use this template, you can expect a plethora of key features such as Schedules, Sliders, Sponsor Section, Event Gallery, Ticket Pricing Table, and Speaker Section and much more. Mate is a Parallax website template specially crafted for businesses, agencies, startups and service websites. This template is based on Bootstrap 4 and has been built using all the latest, futuristic as well as modern technologies such as CSS3 and HTML5. Mate also comes packed with a bundle of unique features that are super developer-friendly. It also has a high engagement quotient since it uses interactive parallax scrolling, attractive backgrounds as well as foreground animation designs. Crystal is another template that has been created using cutting-edge technologies and plenty of creativity such as HTML5, LESS and Bootstrap 4 for Multipurpose use cases. Its code is well-optimized, well-commented and based on a block structure. Users can easily customize as well as use the Crystal template without much effort. In addition to that, the design of this template is very clean and comes with several ready-to-use components as well as elements such as Normal Menu, OffCanvas Menu, 4 Homepage variations, Video Background Section and much more. Proton template is ideal for startups, agencies, WebApp, SaaS and landing pages. It is based on HTML5 and Bootstrap 4, so the pages are highly responsive. You get more than four variations for Homepage, so you have all the freedom to choose the one that fits well for your purpose. The pages are fully responsive, and the design is trendy and highly refreshing. You get a sortable gallery for the pictures and a contact form that works perfectly. To sum up, it is a great template if you want to launch your website quickly with a trendy look. Vanilla is a one-page website template based on Bootstrap 4 that has been specially designed for software, business, SaaS and app websites. It comes packed with all the necessary and required elements as well as sections to launch any kind of one-page website with ease. Vanilla is also based on several cutting-edge and innovative frontend development/design tools. Hence, it is straightforward for developers to customize the template. In addition to that, the template has an immaculate design that is attractive and can be your potential ticket to the next web project. Essence is a one-page website template that is based on Bootstrap 4. It is perfect for business websites, apps or landing pages. With Essence, you get four different variations of Homepage for multipurpose websites. There are several sections like the team section, service section and much more. CSS3 animations are also available in this template. There are more than 20 essential elements and tons of icons that you get with the template. Along with everything else, there is also a free update for the future. You can go for it if you are looking for a one-page website template to launch your website or the landing page quickly. ClassiAlly is perfect for listings, classified ads as well as directory template. It can be easily customized and come with more than 30 pages and tons of UI elements that are readily available for use. It is built with Bootstrap 4, has a clean design and is speed-optimized. It has all the latest technologies like CSS3, SaaS, HTML5 and much more!. If you are looking for a high-quality classified ads or listing website, template CladssiAlly is perfect choice for you. Fusion is a top-class template for building the landing page for your products, business, SaaS or business. Fusion is equipped with the latest version of Bootstrap 4. It is a very modern and completely responsive design that is equipped with the latest technology like HTML5, SASS, and CSS3. The best feature of this template is its friendly UI/UX that can be customized easily as per the needs and requirements of the landing page. The Stack template can be called as a premium template for your business website which is comes with clean and refreshing design. It works with the latest version of Bootstrap and is perfect for a Startup, business, or an agency. It offers a lot of flexibility in its design if you want to use it to build your website in order to launch your business. It has all the sections that are necessary to build your website without any hassle. The UX/UI design of this template is simply perfect. Slick is a high-quality multipurpose Bootstrap 4 Template comes with 2 unique homepage versions. Homepage 1 for Business, Agency, Startups and Service Provider Sites. Homepage 2 crafted for Apps, SaaS, Product and Landing Pages. The design quality of Slick trendy and modern and comes with all essential features and sections you need to build a complete websites with ease. Furnish is Bootstrap 4 based web template, specially crafted for furniture, interior and decoration websites. It comes with high-quality design, all essential sections and features you need to create a complete furniture, decoration or interior websites. EventUp is high-quality event and conference template built-on Bootstrap 4 and HTML5. It comes with all essential features and sections you need to build a full-featuted event, conference, meetup, congress, seminar or similar website. BizLab is a business website template that comes with minimal and clean design. This template is also based on Bootstrap 4 and is so simple, minimal and standard that it can essentially be used for all kinds of agencies, businesses as well as service provider websites. This template is very well-designed, and its best feature is probably its minimalistic components. If all you are looking for is a standard website with a few basic features, BizLab is the ideal website template for you! EstateBit is a web template especially catered to real estate websites. There are more than 20+ pages that are specifically designed for real estates. It also offers three different variations for Homepage and more than 100 elements. It has a coding structure that is block-based, a SASS generated Style-sheet and well-documented codes for the ease of the developers. It offers more than 300-line icons with the template. You also get unlimited colors with it. Overall, it is perfect for any real estate or property related website. Bolt is another website template that is meant for “Coming Soon” pages as well as under construction sites. It comes with an option of three distinct homepage variations and has several handy elements designed to launch the perfect “Coming Soon” website. Bolt is built-in with HTML5 and Bootstrap 4 according to your needs and project requirements. This website template also has a super clean user interface. If you have a product or a service that is not yet ready but is steadily reaching its completion, this website template can prove to be very useful for you. You can use it to introduce your brand and engage the audience for the big reveal! What are the differences between Standard and Developer Bundle? 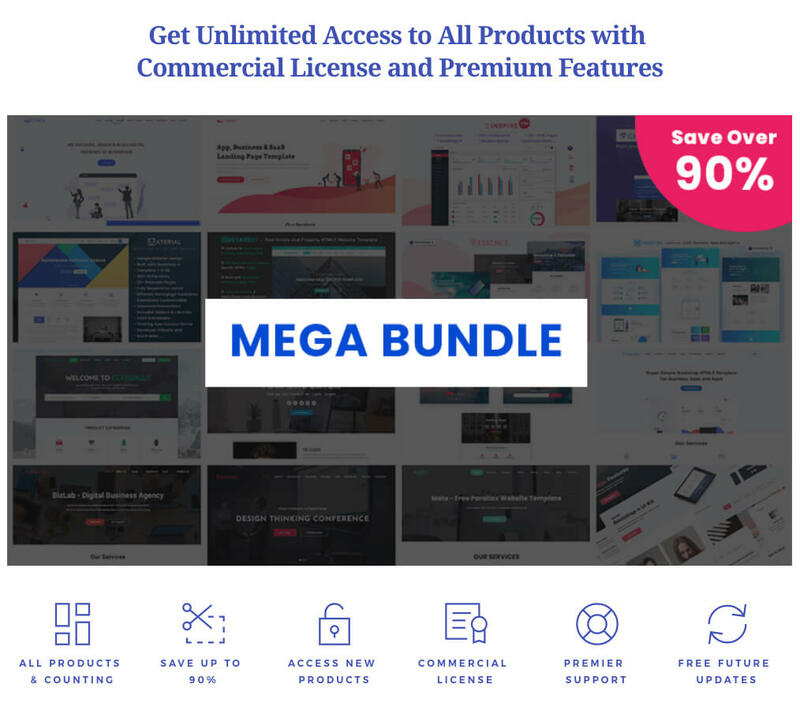 If you purchase Developer bundle you are allowed to use all of our products with multiple commercial projects, when Standard bundle allows you to use each product with only one commercial project. Can I Download The File Anytime I want? Yes, you can download your purchased Bundle files anytime you want within one year of purchase by login to your UIdeck account. Can I Use Bundle Products for Commercial Projects? Yes, You are allowed to use these templates and UI kits with commercial projects and charge clients/customers.